"People will tell you it's too early, don't believe it. Start your search freshman year." Freshman year is when you lay the foundation for your college search. If it's September of your freshman year, you have less than 36 months left in the recruiting process; if it's later than September, well you can quickly do the math. If you're starting after freshman year, implement the following steps as quickly as possible and catch up! Keeping track of communication and being proactive is very important. Do these things and you'll be ahead of the game. Set up a new email account on Gmail or Yahoo that is only used for your college recruiting. Use an email address that is your first name, last name, and high school graduation year (for example, BethKing2016@gmail.com or Beth_King2016@yahoo.com). Create an email signature that is included with each email you send (Gmail and Yahoo allow you to automatically include a signature). In the signature have your name, class year, jersey number, link to your player profile, and club name. Create email folders for each of your target schools. This allows you to easily track your communication with the college coaches, and to store received emails such as ID Clinic invites. We strongly recommend that you share your recruiting email password with your parents so that they can assist in proofing emails and monitoring your progress. (We also strongly recommend that you don't share it with anyone else.) Parents, just because you have access to the email account doesn't mean that you should be emailing as the player; coaches can tell the difference between an email from a 15 year old girl and a 45 year old parent. Use your soccer email address on all profiles and other information that goes to coaches. Check your email often! A common complaint among coaches is that prospects do not respond to their emails in a timely manner. Many high school students are more Twitter, SnapChat, etc. centric, but coaches use email for their recruiting communication. Often, athletes are advised to make an initial list of 10-20 colleges and universities. But without understanding the Campus Factors that are important to you, any such list is largely just a random list of schools. There are over 1,000 NCAA women's teams and Elite College Sports covers just over 100 of these programs. Defining Three Campus Factors will help to quickly narrow your list. Note that these factors have nothing to do with your level of academics or soccer ability, but instead focuses on the environment you most like. So before making your list of schools, see how many of these Campus Factors you already know. It's alright if these aren't yet clear, you're only a freshman. Do you have a geographical preference and how many hours drive from home is your maximum? If having your parents attend home games is important, what is the limit that makes that possible? Do you have a campus setting preference? For example, do you definitely want an urban area (such as New York City, Chicago, Los Angeles) or do you definitely want a rural area? If you're leaning towards an urban or small city environment, do you want your college integrated into the city or do you prefer a defined boundary between campus and community? What is the smallest and/or largest undergraduate population that you'll consider? For example, of the ECS schools, Haverford has 1,200 undergrads, whereas, The University of Wisconsin has 28,000. You might have to visit some campuses to get a feel for this Campus Factor. Many students initially state, "I don't want a small school." without first experiencing the range of school sizes. Don't initially rule out schools based on the number of students. The campus characteristics can make schools with large enrollment actually feel smaller than schools with fewer students. The goal is to determine these Three Campus Factors over the next 12 months, which will, in turn, affect your list. This also entails visiting a variety of campuses... hopefully to watch some women's college soccer. Just by building the initial list of schools you will begin to understand your preferred college environment, which will also help to further define your Three Campus Factors. You likely don't know what academic or soccer level will ultimately be appropriate, so don't get too focused on that at this time. 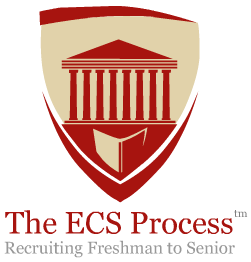 Instead look for a range of schools that best meet your Campus Factors, using the ECS College Selector. This list will likely change and ultimately narrow over the next 24 months. If you'd like to consider a wider group of schools than covered by Elite College Sports, we recommend that you use College Match from CollegeData.com, just click here to access. Colleges Admissions and Athletics want student athletes with a genuine interest in the school and the sports program. There are two places where you should now register on each school's website: (1) most colleges will have a place to register on the Athletic site for prospective athletes. Registering as a prospective athlete will get your name on the mailing list for camps and clinics, and it will also get you into the prospective athlete database; and (2) on the Admissions part of the website you can register as an interested student; this is sometimes listed as the place to register for more information. Registering as a freshman will show that you've had an ongoing interest in the school and will be another "touch point" that admissions will see as a part of a future application. Also, most college teams have Facebook and/or Twitter pages. "Like" or "Follow" the team page so that you can get a more personal feel for the team and coaches. You might already be on a team that will provide an opportunity to play in front of college coaches, and you might have a club coach who can help in your college search. If not, this can be a tough one. Perhaps you've played with a team for years and are loyal. You can still get a college position if you're not on a team that will showcase your talent, but you'll need enormous extra effort to make it happen; and you'll be at a disadvantage versus the other players who are on such teams. Ideally, your club team should be attending some of the national showcase tournaments such as Disney Showcase, Jefferson Cup, Las Vegas College Showcase, PDA Showcase, or any of the ECNL tournaments. As a freshman, DI and DII coaches can’t call or email you, or have any contact with you or your parents off their campus. You can receive brochures for camps and questionnaires, but no personalized recruiting materials. However, you may call the coach and they can then speak with you. Not only can DI and DII college coaches not call you, they can't even return a call if you leave a message for them (they're not being rude); nor can they email with you. So how do coaches communicate with you and let you know they are interested during freshman and sophomore years? Typically through your club coach. DI and DII college coaches are allowed to contact your club or high school coach at any time. And while they can't call you, they can take your calls. So typically, they'll call your club coach and request that you initiate a call to the coach. Not exactly the most efficient form of communication, but that's the rules. College coaches can, however, meet with you on their campus and even have you do a sleepover (you'll be charged a nominal fee for sleeping over and meals); these are called "unofficial visits" and you aren't limited on the number of these. Official visits (that is, paid for by the athletic department) are not allowed until senior year. Calling college coaches is a very important detail in the ECS Process. Remember, one of your goals is to differentiate yourself from all of the other high school players. Most high school girls are intimidated by the prospect of calling a college coach, which makes it all the better way to differentiate yourself to the coach. Start calling them weekly and they might see you as a crazy stalker, but making a call to introduce yourself or to thank them for watching you play can make a lasting impression. As a freshman, Division III coaches can send you recruiting material, email, and call you (and, of course, you them). However, the recruiting timeframe for DIII is typically later than DI and DII, so in reality few focus on freshmen. This doesn't mean that you should ignore DIII schools during your freshman year. Visit some DIII campuses to help define your Three Campus Factors; better yet, attend some spring and summer soccer clinics at a couple of DIII schools that are of preliminary interest. One restriction is that DIII coaches cannot have off campus contact with you or your family until after your junior year. As with DI and DII schools, there is no limit to how many colleges you can visit, but the college can't cover any of your expenses until senior year. Many of the most selective colleges and universities place a high importance on the rigor of your course load. Your ability to take honors and/or AP classes as a junior or senior are affected by the courses you take as a freshman and sophomore. Don't reach the latter part of your junior year and find that you aren't able to get through admissions (even if you're a very strong player) because of the lack of academic rigor on your transcript.